Weather Channel Founder John Coleman, a meteorologist for over six decades, is warning that Al Gore may win the decades long “global warming” debate if the victor of the 2016 Presidential election further cements the UN Paris climate agreement and EPA regulations on carbon dioxide. “This election may be a ‘tipping point’ in the climate debate,” Coleman declared in an interview with Climate Depot. “Climate change, a scientific issue, has now totally become a political issue. As a result, we skeptical climate scientists are perhaps about to be handed a major defeat in the climate debate,” Coleman said. “President Obama imposed the UN climate agreement on the United States without Senate ratification. Then the President’s Environmental Protection Agency implemented climate rules without a single vote of Congress. If the next President does not overturn these regulations, U.S. citizens will suffer the consequences as energy prices soar over the next eight years,” Coleman explained. “Al Gore may emerge from the shadows to declare victory in the ‘global warming’ debate if Hillary Clinton moves into the White House. Yes, if that happens and the new climate regulations become the law of the land, they will be next to impossible to overturn for four to eight years,” Coleman added. 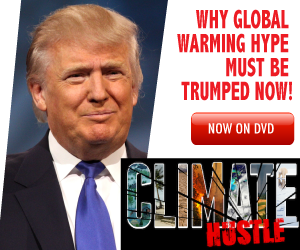 “Climate Hustle,” the movie that exposes the facts and propaganda being used to promote global warming alarmism, is now available in the U.S. on DVD and Blu-ray. It was the #1 movie in America (per screen average) during its one-night theater event in May, playing in 400 theaters in over 200 U.S. cities. Marc Morano, the host of “Climate Hustle,” agreed with Coleman. “Global warming skeptics face the possibly a historic setback in 2016, despite skeptics having won every political battle going back decades from not having the UN’s Kyoto Protocol ratified in the U.S., to defeating cap-and-trade multiple times,” Morano said. “The hard cold truth is that the basic theory has failed. Many notable scientists reject man-made global warming fears. And several of them, including a Nobel Prize winner, are in the new “Climate Hustle” movie,” Coleman recently commented. Coleman provided an on-screen introduction for the film when it appeared in theaters. “We will not give up the fight,” he added. The critically acclaimed film, “Climate Hustle”, reveals that more and more scientists are turning away from climate change fears and are now willing to expose the threat posed by scientifically meaningless, yet ruinously expensive climate policies that will do great damage to our liberty, prosperity and national sovereignty.